anyway, the game is your pretty standard tetris-type game (although to be more specific columns is the closer relative), with the twist that placing blocks in time with the music (usually on the down beats) increases your score multiplier. depending on your love of house/techno this may be a great hook, but while i generally enjoyed the music i didn’t find much of it to be really rousing or memorable. i also found that the central mechanic got quite tedious and that being tied to the beat was too constraining to be much fun. on top of that it felt like it was easier to get chains randomly than through careful planning, and although the game is designed so that you have to fully master the mechanics to beat the harder stages and difficulty levels (apparently there are four), after a few hours of playing through all the stages at the lowest difficulty i didn’t feel at all motivated to invest more time in the game. 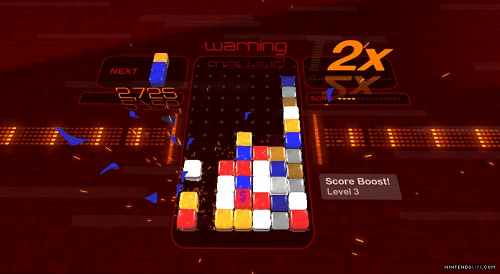 on the plus side, the lumines-esque visuals are pretty polished, esp. for a wiiware title (although the yellow/orangish and red blocks were harder to distinguish between than they should have been), and i don’t doubt that the game has found a decent set of fans. 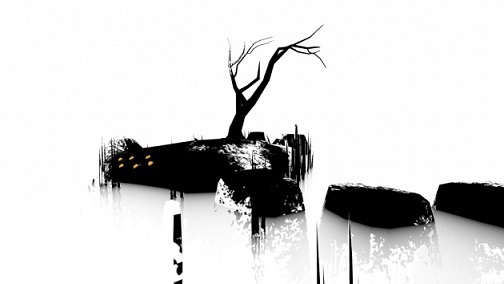 wiiware itself has continued to be more mediocre than memorable, but there are still a decent number of highly praised games for me to check out, probably before too long. still slogging my way through this endless game (which i hope to be done with in at least two weeks). so i just thought i’d post about a site i find useful and end up wasting time on, videogamepricecharts.com. if there’s one thing i love almost as much as lists, it’s charts. haha. the numbers seem to be fairly accurate, so it’s a great way to find out if you’re getting a deal or not; although keep in mind that they’re tracking averages, so if you’re patient you should be able to get a better deal than the average price. what i find interesting (and this is my geekiness coming through, prepare yourself) is seeing how particular events are reflected in immediate changes in price. 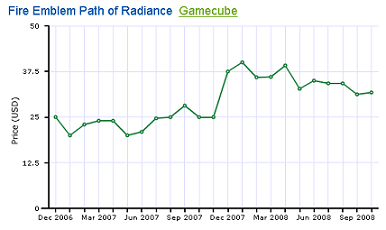 for example, the chart for fire emblem: path of radiance is interesting b/c you can see the huge spike in price from november to december 2007 right before brawl was released; the game, of course, showcased path of radiance’s central protagonist, ike. and when you look at the chart of clubhouse games for the DS you see how the price stayed pretty high as the game became more rare, but then dropped drastically when the game was rereleased recently. it boggles my mind that publishers don’t use tools like this to rerelease games that are clearly in demand, e.g. tetris DS. the creator of the videogamepricecharts.com put together an article for vintagecomputing.com that looks at how much of a deal VC games are overall, given that they’re all consistently priced per platform on the VC even though some have become much rarer than others in the non-virtual world. his conclusion? ah, if only i weren’t such a retro gamer i’d buy way more of these VC releases instead of shelling out $40+ for used copies of games like super mario RPG (only $8 on the VC!). but there’s nothing like the smell of dusty old nintendo cartridges in the mornin’! mm hm!